With some vehicle barrier companies rainwater drainage is an afterthought, resulting in insufficient water capacity, inadequate number of clean-outs, and little thought given to directing the water that is collected. Such inattention to detail can seriously compromise vehicle barrier performance. In contrast to this, the PRO-Drain™rainwater collection and discharge system, by PRO Barrier Engineering, LLC, is integral to the design of our Arrestor model barrier. Each Arrestor has eight separate drains that feed into a larger diameter cross drain that is sized for local rainwater conditions. The cross drain carries the water to the field drain. With over 35 years of experience designing and manufacturing hydraulic powered gate operators, HySecurity has been the premium provider (manufacturer) of extremely reliable and secure, industrial strength gate operators. Hydraulics take advantage of an effective and efficient method of power amplification to produce infinitely variable rotary or linear motion control. A small control effort results in a large, smooth, vibration-free power output providing precise control of load rate, position and magnitude. 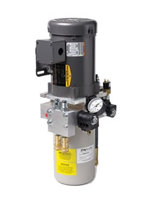 Hydraulic fluid also helps to cool and lubricate the various components of the hydraulic system contributing to extended component life and gate operator reliability. HySecurity gate operators, crash gates, barrier arms and wedge barrier arm operators provide unparalleled reliability, quality, total lifetime value, and field configurable functionality. These respected machines protect everything from terrorism targets to single family residences worldwide. If the site deserves the ultimate in security, performance, and reliability, HySecurity is always the operator of choice. All of our operator designs are tested for millions of cycles before release to the market. Slide, swing, traffic barrier, vertical lift, parking and crash operators all receive the same kind of rigorous testing. Security, reliability, low maintenance, flexible speed and overall toughness are our foremost criteria. View Videos. PRO Barrier Engineering LLC is a U.S.-based company that designs and builds anti-terrorism vehicle barriers. Our designs have been installed at hundreds of commercial and government buildings, military installations, industrial sites, and public venues around the world. 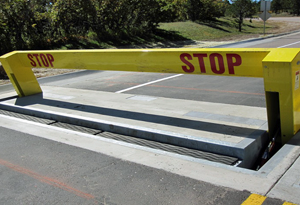 Our niche is high-stopping-power barriers employing advanced materials and aesthetic designs. Whether it is manufacturing our own barriers or providing behind-the-scenes engineering services to other manufacturers, we have been responsible for many of the industry's design innovations, including the first portable barrier, first aluminum barrier, first non-metallic barrier... and more. TrafficGuard, Inc. 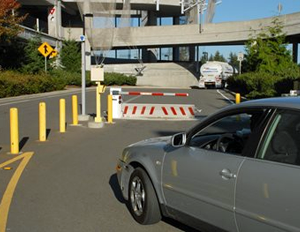 Direct specializes in manufacturing top-of-the-line manually operated removable and collapsible vehicle access control bollards to help secure your restricted access areas. Our traffic bollards will assist in providing the security you need to stop unwanted vehicle access and provide protection against increasingly common ram-raiding crime. 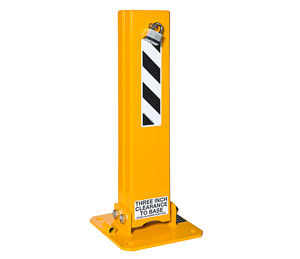 Our traffic bollards are manufactured in the USA, from high quality USA steel to ensure durability - even under the toughest conditions. Whether you're looking for parking bollards or complete vehicle access and security systems, we have the right products at the right prices. To determine which bollard is right for your needs, download our free bollard buyers guide. If you have any questions, please let us know. Our knowledgeable customer service representatives are happy to assist you.